Trigger thumb is a condition that happens in babies and young children. Usually it happens only in one hand, but sometimes it happens in both hands. If your child has trigger thumb, their thumb will pop, click, or catch when they try to straighten it. It might lock in a bent position. If it locks, they may be able to pull it straight using their other hand (or you can pull it straight for them). But sometimes they won't be able to straighten it just using their thumb muscles. 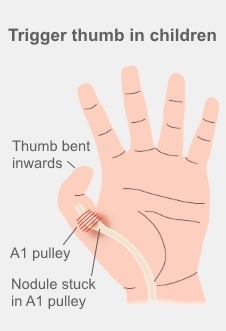 We move our thumbs with a tendon that connects a muscle in our forearm to the tip of our thumbs. Near the base of our thumb the tendon runs through a tunnel of tendon, which can be quite thick in places. Doctors call this the A1 pulley. We don't know why this happens in babies. It's usually not there at birth. Often a parent first notices it after their child has fallen or had an injury and can't straighten their thumb, but it's likely it was already there. How do I know if my child has a trigger thumb? If your child has a trigger thumb, their thumb will pop, click, or catch when they move it, or it will be locked in a bent position. Trigger thumb is usually painless, however if it gets stuck in a bent position it can be painful to force it straight. Your child may have swelling in their thumb (usually near the base), or a bump on the palm of their hand, near the base of their thumb. If you suspect your child has a trigger thumb, it is important to see your GP or nurse practitioner. They will ask questions about your child's symptoms and examine their hand and fingers. They will also check to make sure they don't have some other problem, like a broken bone or a joint that's out of place (dislocated). The doctor or nurse practitioner will also check for signs of any health conditions that may affect your child's hands, like cerebral palsy. Most children with trigger thumb don't have any other condition. It's unlikely your child will need other investigations such as X-rays. On the next page: How is trigger thumb treated?